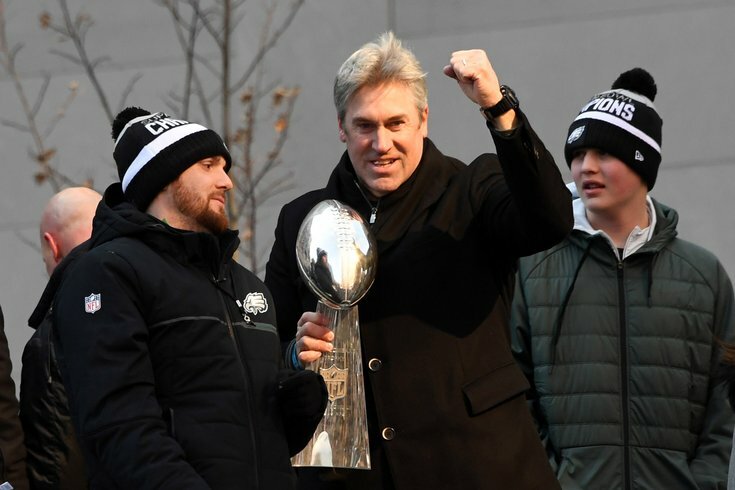 Doug Pederson performed a miracle for the Eagles earlier this year, and soon he’ll have a championship ring to prove it. Sixers coach Brett Brown had a terrific regular season but a putrid playoff series against Boston. He still has one of the worst coaching records in NBA history. OK, I give up. Why is there not a peep in this city about rewarding Pederson for his brilliance last season, but a full-blown outcry for Brown to get a lucrative new deal? Let me put this in the simplest terms. Doug Pederson needs to get paid, right now, for what he did. Brown deserves not a penny more until he proves he can perform far more effectively when the games count the most. Although coaches’ salaries are no longer made public by the NFL, it is widely believed that Pederson is getting around $1 million per year, a windfall for the average working man but a pittance in professional sports. He never made much money as a back-up quarterback for 13 NFL seasons, either. Yes, the Eagles picked up the option on his contract after the Super-Bowl win, giving him security through 2020, but at a price negotiated when Pederson had no leverage. Pederson is far too gracious to say anything, so I will. Chip Kelly made $32.5 million when he coached here – that’s no typo: $32.5 million. At the current rate, Pederson will be 80 years old before he reaches that figure. Maybe the Eagles should ask Bill Belichick how well Pederson coached in the Super Bowl, when the novice snookered the greatest NFL coach of all time with that “Philly Special” gadget play just before the half. Or how about the deft play-calls in the latter stages of the game, after the Birds had fallen behind, 33-32? Earlier this month, I asked GM Howie Roseman whether he planned to reward Pederson for his stunning achievement, and I all I got in return was some babble: “Who wouldn’t want a coach like Doug?” he said. Oh, please. If Nick Foles and Brandon Graham were worthy of new deals, so is Pederson. Meanwhile, Brown – who is already making double what Pederson is – had his best year as a head coach with a 53-win season and a first-round ouster of Miami, but then the career assistant hit a wall bigger than the Green Monster. Celtics coach Brad Stevens destroyed Brown in a series the Sixers were favored to win. It’s pretty safe to say Stevens is not exactly Bill Belichick yet, but he unmasked Brown as a possible weak link in the beloved Process, winning every close game despite a short bench and some inexperienced players. All you really needed to see is how Stevens drew up the defining play in Game 3, isolating Al Horford on Robert Covington under the basket. Stevens was the rightful recipient of lavish praise for that call, but there was a coach on the other bench whose job it was to counteract that strategy. Clearly, he didn’t. In this Process era, the rules for criticism clearly have changed – but not for me. Brett Brown blew that series. Look at it this way: If Stevens were coaching the Sixers and Brown the Celtics, which team would still be playing now? Coaching was the biggest factor in those five games. The bottom line is, Doug Pederson deserves to be treated like the champion he is. The fact that the Eagles haven’t rewarded him yet – while the city campaigns for Brett Brown – is a disgrace. Life tends to get more complicated after a championship, as the Eagles are discovering now that they have received an official invitation to attend the White House on June 5. It is hardly a secret that Eagles owner Jeffrey Lurie cannot stand the sight of President Donald Trump. If you missed it, Lurie recently called the Trump presidency “bleeping disastrous.” By the way, Lurie didn’t use the word bleeping. He used the other one. And then there’s Malcolm Jenkins, the team leader who didn’t receive well the president’s label as a SOB because of the anthem protests the past two seasons. By the way, Trump didn’t use the initials when he branded the protestors. He used the actual words. Chris Long, an activist who donated his entire salary last season to charitable causes, also plans to boycott the visit, as does linebacker Donnell Ellerbe and probably at least half a dozen other players. Their argument against going is simple: Why tacitly endorse the actions of a president that they revile? Why act like everything is fine while the leader of the free world keeps doing things that these players feel are injurious tor the country and bad for their fans? It is a strong argument – but it is also the wrong argument. The Rose Garden ceremony has never been a political event. It started all the way back in 1865 and became an all-sport tradition during the Reagan administration in the 1980s. At no point has it carried any political implications. The notion that it is hypocritical for players who hate the president to pose for photos with him is ludicrous. It’s like saying these players should associate only with people who share their ideologies. Actually, America remains the most powerful nation in the world because it welcomes dissent. If the players who plan to boycott the White House are really concerned about the fans, they will put aside their radical differences with the president and enjoy an honor they richly deserve. Eagles fans love nothing more, even now, than to be reminded of the team’s incredible championship. With every win by the Las Vegas Golden Knights, Ron Hextall looks more ridiculous. I have actually adopted the amazing first-year expansion team for the rest of the playoffs just because it is further exposing the Flyers GM as the fan-unfriendly fraud he has become. Since Hextall became GM in July of 2013 – nearly five years ago – his condescending message has never wavered: The rebuilding process cannot be rushed. Patience is a virtue. Blah, blah blah. The truth is, there’s no reason to believe Hextall knows how to build a winner, unless you think he was the reason the Kings won it all six years ago. Hextall was the assistant GM in LA back then, and it was inevitable that he would get the next GM job here, following the unbroken procession of ex-players Bob Clarke and Paul Holmgren to the throne. Since then, Hextall has done little more than mark time, searching futilely for a goaltender half as talented as he was and for a coach who has a clue. The Golden Knights needed no such tedium. They hired a coach with a winning pedigree, Gerard Gallant, and handed the nets over to Marc-Andre Fleury. Gallant had a record of success in Florida, and Fleury in Pittsburgh. Imagine that. The Golden Knights found people who had already established themselves in the NHL. What a concept. It isn’t just that Hextall’s five-years-and-counting rebuilding plan looks foolish when compared to the meteoric rise of Vegas. Equally annoying is the ex-goalie’s attitude. Despite the undying affection of fans who still remember how good he was on the ice, Hextall remains hostile and belligerent for no good reason. Last week he mounted his high horse yet again when he blustered: “My philosophy is I do what I believe is right. I'm not going to do something to make me popular. I'm not going to do something that's going to take away from the success of our team to put a few more people in the stands." Attendance has never been softer than it is right now for the Flyers at the Wells Fargo Center. TV ratings have plummeted in the past year. People are tuning out the Flyers, despite some promising young talent. They cannot stand the stone-faced coach, Dave Hakstol, and they are finally losing faith in the team’s obnoxious GM. Go, Golden Knights. I’m looking forward to hearing what Ron Hextall has to say when an expansion team wins the Stanley Cup before he does. Phillies manager Gabe Kapler keeps insisting that he prefers a closer-by-committee approach, even though he locked in on Hector Neris for a month before the reliever faltered. I don’t buy it. Kapler let Seranthony Dominguez close the game Saturday in St. Louis, and that’s the arm to watch in that bullpen for the next few weeks. With a 98-miles-per-hour fastball and a biting slider, Dominguez will be the closer before the All-Star break. By then, Kapler will have a whole new philosophy. How gritty were the world-champion 2017 Eagles? From the start of that miracle season to now, 10 different players have required surgery – five since the Super Bowl. Alshon Jeffrey, Brandon Graham, Derek Barnett, Tim Jernigan and Mychal Kendricks won a championship with bodies that were already in need of serious medical attention. That’s amazing. That’s the kind of sacrifice it takes to win a championship. The recent allegations that Eagles running back Jay Ajayi trashed a mansion in Los Angeles after the Super Bowl – which he denies – did raise an issue that bears watching. Ajayi’s reputation before he joined the Eagles was not great, nor is that of his new teammate, defensive end Michael Bennett. The Eagles had a special culture last season. Can they bring it back in 2018? I’m beginning to have some doubts. By far the best news of the week was the decision by the U.S. Supreme Court to pave the way for legal sports betting in America. I am no gambler, but there are few places more exciting for a fan than a sports book on a Sunday in the fall or during an early round of the NCAA basketball tournament. Surrounded by dozens of games in a massive room with huge TV screens and flashing tote boards, fans are going to love the experience, even if they don’t bet. Speculation is growing that two of the biggest pending free agents in sports, LeBron James and Manny Machado, will seriously consider Philadelphia as their next home. So which one would be a better fit? My vote is for Machado, who is just entering his prime and provides big offensive numbers at a position (shortstop) usually noted for defense. Plus, I wouldn’t want the Sam Hinkie zealots to lose their minds if someone tried to take a shortcut in the sacred Process.